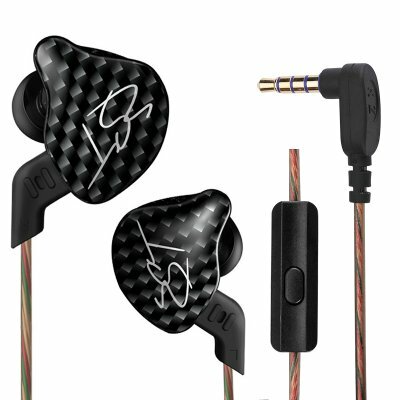 Successfully Added KZ ZST Sports Earphones - Built-in Mic, Hi-Fi Sound, Dynamic Bass Unit, Noice Cancelling Technology, 3.5mm Audio Jack, 106dB to your Shopping Cart. No matter the time of the day, with the KZ ZST earphones you’ll be able to enjoy all your favorite music in audiophile quality. Coming with the latest noise isolation technology these Hi-Fi headphones let you listen to all your music in stunning quality without being distracted by outside noises or annoyances. So pump up the volume and enjoy all those classic tracks in stunning beauty – by delivering up to 106dB you can be assured that you can fully enjoy all your favorites without getting interrupted. Coming with three different sized silicone ear plugs these stylish earphones are guaranteed to deliver a conformable fit no matter the size or shape of your ears. With its built-in microphone, these headphones not only allow you to listen to the music you like but also give you the possibility to make phone calls without the need to reach for your phone. Its miniature remote that has been built in the write lets you answer calls, adjust volume, and switch in between songs with the simply touch of a button – offering an astonishing smooth user experience. Well crafted these earphones feature a stylish and sporty design, making them, besides a source of amazing audio quality, also a feast to the eye. Coming with a universal 3.5 Audio Jack these headphones are guaranteed to fit on the majority of electronic devices out there. With its Hi-Fi audiophile grade sound quality, this headset delivers an exceptional high bass, making them great to be used for any genre of music. The next time you head out for a run or simply like to enjoy some music at home without disturbing your surroundings, take out the KZ ZST earphones and enjoy all your tracks in absolute beautiful quality. With this pair of earphones you are guaranteed to experience an audio experience like never before, fit for any audiophile out there – making the KZ ZST earphones the perfect accessory that will help you enjoy your favorite music where ever you are. The KZ ZST earphones comes with a 12 months warranty, brought to you by the leader in electronic devices as well as wholesale electronic gadgets..
Arabic: - سماعات هاي فأي - Chinese Simplified: - 高保真耳机 - Czech: - Hi-Fi sluchátka - Dutch: - HiFi koptelefoon - French: - Écouteurs hi-Fi - German: - HiFi-Kopfhörer - Hebrew: - אוזניות סטריאו - Hindi: - हाय-fi इयरफ़ोन - Hungarian: - Hi-Fi fülhallgató - Italian: - Auricolari Hi-Fi - Japanese: - Hi-Fi イヤホン - Korean: - 하이파이 이어폰 - Malay: - Hi-Fi telinga - Norwegian Bokmål: - Hi-Fi-hodetelefoner - Romanian: - Hi-Fi căşti - Russian: - Привет-Fi наушники - Spanish: - Auriculares hi-Fi - Thai: - หูฟังไฮไฟ - Turkish: - Hi-Fi Kulaklık - Vietnamese: - Tai nghe hi-Fi. very good and cost effective i only hear this crystel clear audio in high end headphones costs nearly 100 to 120 dollars. this one was very nice and good clarity.